Situated in one of the most scenic counties in New Jersey, Basking Ridge has a history that dates to the early 1700s. Now a part of Bernards Township, the downtown district, and several other sites appear on the National Register of Historic Places and/or the New Jersey Register of Historic Places. With historic buildings, brick sidewalks on some streets and abundant parks, Basking Ridge has lost none of its old-time charm. However, modern property owners in Basking Ridge have easy access to a commodity that was rather costly and scarce when the first structures were built in the area — glass. It was not until the end of the 18th century that glass windows and decorative mirrors became common in the average home. Today, glass is an affordable option with many structural and decorative uses in homes, offices, restaurants, and shops. Glass showers and tub enclosures lend an elegant look while making the room feel more spacious. Sliding enclosures are a traditional look that can be used for shower stalls as well as tub enclosures. They are functional, attractive, require little space and are suitable for any décor. Frameless styles offer a more contemporary look and are considered by many to provide a feeling of true luxury. Semi-frameless styles provide the functionality of a frame with the sophisticated look of a frameless style. From a contemporary glass-and-metal executive desk to a protective top for an antique dining table, glass is an attractive material that is durable, easy to clean and sophisticated. Glass is ideal for any interior décor, including traditional and modern. A glass tabletop added to your nightstand, dining table or coffee table protects the wood without concealing it. Glass furniture allows an elegant or unusual base to take the center stage or highlights a luxurious area rug. Mirrors make a space seem brighter, larger and more cheerful whether the space is an office, kitchen, foyer, gym, bathroom or dance studio. From full-length wall mirrors to mirrored backsplashes, every area can benefit from the drama created by the reflected light. Custom-designed, well-placed mirrors that are the correct shape and size add an additional decorating touch that is difficult to achieve with any other method. A company’s storefront is the image that it projects to current and potential customers. Cracked or damaged windows and doors, as well as hardware problems, can make a bad impression. Fire-rated, safety, energy efficient or tinted glass can transform a storefront and enhance its visual appeal. For the home, glass replacement, storm inserts, window tinting, and screens can help protect the interior while improving the property’s curb appeal. The judicious use of glass in the kitchen can make any home feel as if it has received an elegant upgrade. Glass cabinet fronts make the room seem brighter while allowing the colorful dishes or beautiful glassware to be safely displayed. Installing a custom-made glass breakfast bar adds an elegant touch while providing a durable, functional, attractive option for informal family meals or snacks. The Glass Castle has been providing quality work to commercial and residential customers since 1990. 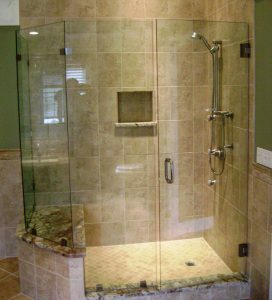 We offer an extensive range of glass-related services, including custom shower doors, mirrors, and glass tabletops. Visit one of our showrooms or call for a free estimate.